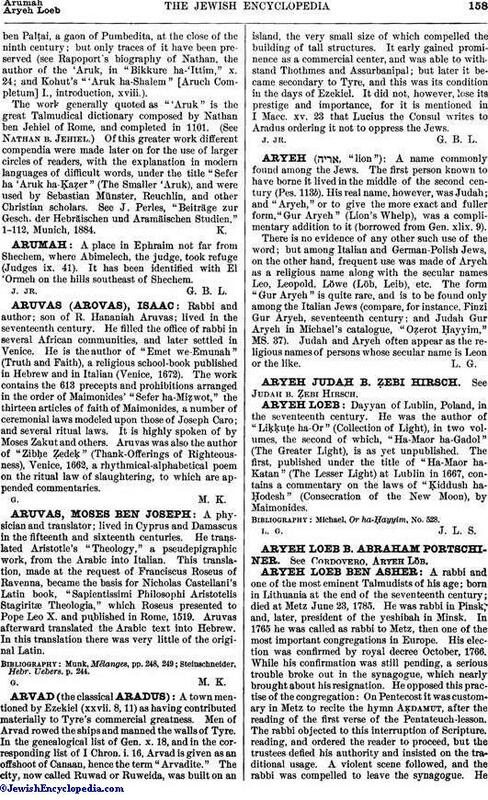 Rabbi and author; son of R. Hananiah Aruvas; lived in the seventeenth century. He filled the office of rabbi in several African communities, and later settled in Venice. He is the author of "Emet we-Emunah" (Truth and Faith), a religious school-book published in Hebrew and in Italian (Venice, 1672). The work contains the 613 precepts and prohibitions arranged in the order of Maimonides' "Sefer ha-Miẓwot," the thirteen articles of faith of Maimonides, a number of ceremonial laws modeled upon those of Joseph Caro; and several ritual laws. It is highly spoken of by Moses Zakut and others. Aruvas was also the author of "ZibḦe Ẓedeḳ" (Thank-Offerings of Righteousness), Venice, 1662, a rhythmical-alphabetical poem on the ritual law of slaughtering, to which are appended commentaries.